Brindle, big and sometimes brainless! !, but best described as a very handsome boy. We call him ?Fluffy Duffy?, but this has nothing to do with his fur!! Came originally as a foster dog as he had to have part of his tail amputated due to a racing injury. Came, stayed and never went! ? how could we bear to part with him? The first 6 years of his life were spent in kennels, but he has adapted to home life very quickly, and is much loved by his two doggie friends Ricky and Amber. He is currently having hydrotheraphy to relieve stiffness in his back legs caused probably by being over-raced. Duffy has the most wonderful ears ? whilst out fundraising on one occasion a little girl asked her Mum if she could go and see the Donkey!! 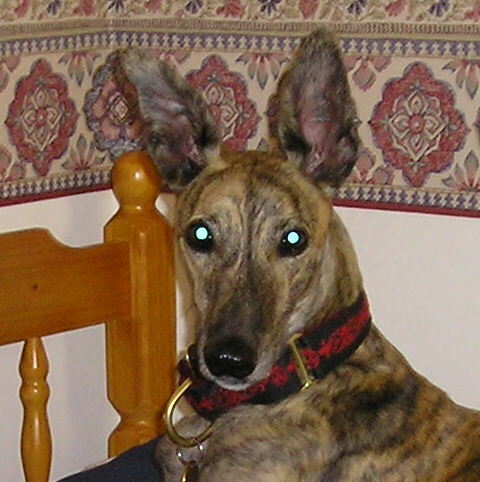 He continues to help promote the profile of Greyhounds/Lurchers as most weekends he forms part of our trio at fundraising events, where he endears himself to the general public. A wonderful addition to our pack, who just loves his new life.